Joe Allen has warned Wales' Euro 2016 rivals to expect a different team when Gareth Bale and Aaron Ramsey return. Wales' 1-0 defeat to Ukraine in Kiev on Monday night means Chris Coleman's side have now won only one of their last six games, and none of their last three. Since securing Euro 2016 qualification last autumn, Wales have lost friendlies to the Netherlands and Ukraine and been held at home by Northern Ireland. "Any international team would miss players of that quality," said Allen. 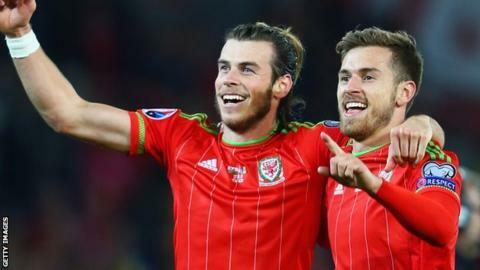 Real Madrid forward Bale and Arsenal playmaker Ramsey have missed the three friendly games through injury, and Allen admits their presence makes a massive difference to Wales. "To have the chance to welcome them back into the group is a massive bonus for us," he said. "It's going to help bring the real best out of the team." Wales will line up against England, Slovakia and Russia in the group stages at Euro 2016. But Allen said pre-tournament results had no bearing on what happens at the finals in France this summer. "Whether it is a friendly or not, the result is important, but it's not the be all and end all at this stage," said Allen. "Teams in the past have flown through friendlies, drubbed teams and then disappointed. "So I don't think it's too much we will look at. "We will analyse the way we have performed, any strengths and weaknesses and work on them." Wales certainly have work to do at defending set-pieces, something which manager Coleman attested to during the post-match inquest in Kiev. Andriy Yarmolenko's winner came from a free-kick and Wales have now conceded four goals from set-plays in their last six games. But Allen said: "I don't think it's quite at the stage of being an issue. Soft is the word to describe it. "I thought there were a lot of positive aspects from our performance, so to lose it with that one moment where we lost our concentration is disappointing. "But we have played 180 minutes (against Northern Ireland and Ukraine) without conceding a goal from open play, and that shows how defensively strong we can be as well. "It's something we pride ourselves on in the past and we will keep working and make sure we get it right when the Euros do come around. "We certainly don't want to go into the tournament making those kind of sloppy errors and I think that's the silver lining of the goal we have conceded. "We will make sure we get it right in preparation for the tournament."